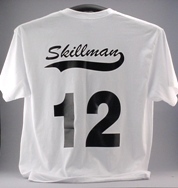 Prices vary with shirt color, size of print(s) and number of colors of print. Please call for pricing information. We can help you design the perfect T.
With millions of graphics at our finger tips the possibilities are endless!